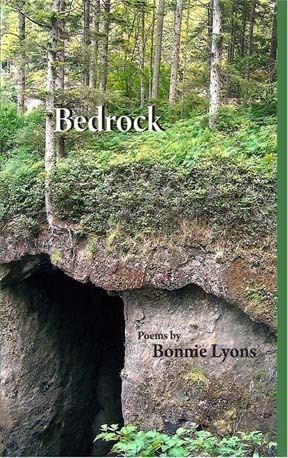 Bonnie Lyons’s first full-length book of poems, In Other Words, was published by Pecan Grove Press in 2004. Her chapbooks, Hineni (2003) and Meanwhile (2005), were both published by Finishing Line Press. Her poems, articles, and literary interviews have appeared in a wide variety of literary and scholarly journals, including The Paris Review, Contemporary Literature, and New Letters. She is also the author of Henry Roth: The Man and His Work and co-author of Passion and Craft, interviews with fiction writers. A Professor of English at the University of Texas at San An­tonio, she has received teaching, creative, and research awards from the university. She has taught as a Fulbright Professor at the Aristotelian University in Thessaloniki and at the Central and Autonoma Universities in Barcelona, and has also been a Fulbright lecturer in Athens, Rome, Florence, Haifa, and Tel Aviv. She and her husband and their Airedale Jake escape to Vermont most summers. "Bonnie Lyons' first full-length collection of poetry pulses with 'the terrible questions' that plague the often unnamed, unvoiced women of the Bible. From the searing rage of Tamar to the patient insight of Rizpah, from Jezebel's ferocious warning to Jael's painful revelation, these forceful revisionary versions of Biblical episodes offer us a series of dramatic monologues that build, fortissimo, to a resounding chorus." The Evil Eye showed up anyway. for my world-class, champion Bubbe. No Captain Midnight to the rescue. Bonnie Lyons announces “hineni“ “I am here,” and welcomes us into a world “where every vital organ sings” and even the Evil Eye can see the humor in our predicament. “Tell me your story,” she exhorts, as she tells us hers with both toughness and tenderness. Remembering an earlier self she writes, “I love that girl.” And so do we.